3. Put dough onto a lightly floured surface and knead gently until smooth (don't knead dough too much or scones will be tough). 4. Pat dough flat and cut into 6 rounds. If you want to make a bigger batch, simply double all the ingredients in the recipe. 5. 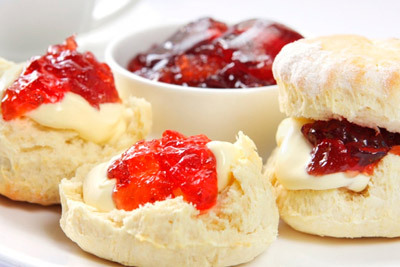 Place scones onto prepared baking tray and sprinkle tops with a little plain flour. 6. Bake at 240°C for +/- 7 minutes (until golden brown). 7. Transfer to a wire rack. Serve warm with jam and cream.